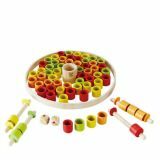 Use your memory to create colorful caterpillars with this whimsical bamboo guessing game! Roll the colored die to learn which colored ring you need to find, then take turns guessing where it was hidden. 30 pieces. Age: 3+ Years. 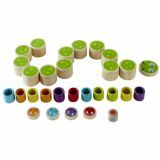 Learn how to think quickly yet carefully with this fun and fast-paced bamboo ring matching game! Age: 4+ Years.